That title may be upsetting to some but it gets my basic point across. We live in a world, not just the â€œfirst worldâ€ where our lives and destinies rely on our ability to communicate with each other. If you distill this concept, itâ€™s really always been that way. Our ability to directly communicate via language, our concepts, thoughts, and emotions to one another was and is a defining factor in why we are the dominant species on the planet. It binds us, separates us and enables us to enact great feats. In short, communication IS our way of life. Currently, the most widespread form of communication between people is the Internet. This covers a very broad spectrum of methods from actually speaking to each other via services like Skype and Google Voice to the use of social networks such as Twitter, Facebook, or Google Plus. In order to take part, to really have a voice that can be heard amongst the din in our worldwide conversations, one must have access to the Internet. I would argue that one must have unfettered access. That is, service thatâ€™s not throttled, shaped, blocked or filtered. To block a user from access to specific data is to limit their ability to speak and understand. This violates a basic human right free and open speech. This would seem to state implicitly to me that no one recognized as a person under law should be deprived of their ability to communicate. The statement â€œâ€¦ through any media and regardless of frontiersâ€ does, very clearly cover the Internet. So if we are following these as a basic concept of Human Rights, logic dictates that unfettered Internet access must be available to all persons under law. Currently governments around the world, in my case the US are considering enabling DNS blacklists. Previously in the US there was a bill known as COICA (Combating Online Infringement and Counterfeits Act) that would have allowed our government the ability to deem any website (with great ambiguity) as infringing upon the law and would allow that the registrar of said domain be ordered to suspend operation of the domain. This would effectively block the site from most people as they would have no ready method of access. The site would still exist on the net but would be unreachable by hosts affected. COICA was killed in the Senate after having never received a full Senate vote. Unfortunately it has now been resurrected as the Protect IP Act. All of this is being done in the name of anti-piracy. It is intended to protect corporate entities from â€œtheftâ€. I can understand the argument for protecting copyrights, but this law would give our government too broad a control over what we can and cannot consume or say on the Internet. 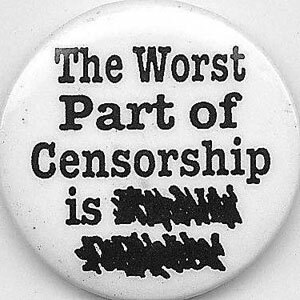 This discussion of Internet censorship is where the new battle for our right to free speech will be waged. I urge anyone who has not at least skimmed the Protect IP Act to give it a read through. It is rather unsettling. The US is of course not the only country that is considering action like this and there are already quite a few that are in worse violation of this human right. The most obvious of these would be China. At the beginning of this year the Egyptian government virtually shut down Internet access in their country when civil unrest boiled over and revolution broke out. The intent was to stop any undesirable information from entering or leaving the country. Iâ€™m not going to step into tin foil hat territory and tell you that the US government is going to shut down our Internet access in the event of unrest, what I am saying is that it is a possibility and something that we should be wary of. Even more recently AT&T has decided that it is going to stop providing unlimited data to its customers who paid for said service. More specifically it is going to throttle the connection speeds of its users who consume the most data. They will still technically have access but at a considerably slower rate than what their original plan dictated. The myriad of other legal questions this raises aside, this would violate Article 19 of the previously mentioned declaration of human rights. It would limit the rate at which a person can communicate on a service that they pay for. Weâ€™ve seen similar censorship with ISPâ€™s shutting off the connections of users utilizing the BitTorrent protocol. If a person steals something in this country, we donâ€™t take the use of their hands other than to restrain them while in custody of the authorities. ISPâ€™s in this situation are acting as judge and jury. They may own the service but they should have no legal authority to dictate our right to use. Iâ€™d like to end by saying that I think this is one of the most important discussions of our time. Here and now is where we will define our rights to communication for our future. What do you think? Are you worried about access to your favorite sites disappearing? Are you concerned about your own ability to say what you want to say? Or do you even think it’s an issue? Let us know in the comments below! Even more recently AT&T has decided that it is going to stop providing unlimited data to its customers who paid for said service. More specifically it is going to throttle the connection speeds of its users who consume the most data. Orlando, you are not crazy at all. In fact I would say you are more sane than those of us who are aware of the situation and simply apathetic about it. This is an important conversation that seems to only be discussed in the background. One could argue that groups like Anonymous are ‘fighting the good fight’ and making both legal and illegal protests against internet censorship. Among other things. And of course we have the work of the EFF on behalf of all of us. But this needs to be a discussion had by all, not just politicians, fringe cases, hackers, and lobbyists. We all need to take part in this. Thanks for the input man, and I’m glad you liked the piece. So everyone in the whole wide world has a basic human right to your spam flood? Or to services provided by hundreds of thousands of commercial organizations? Oh, wait, you mean the other “Internet” that is entirely powered by peace, love, and “free” software. I think you grossly misunderstand what a human right is. I understand the spirit of your message, that human beings have the right to not be lied to or have their communications controlled by the government, but that’s been covered in the USA. And, of course, widely ignored. The Internet is just a medium for conveying messages, and the media just doesn’t matter. You could just as well be railing that the government not be allowed to control the use and breeding of carrier pigeons. Which are illegal in some towns, due to “public health” laws. Wes, you seem to think that just because the Internet is polluted with spam and advertising that it can’t still be a tool free and open communication. The two are not mutually exclusive. And as for the “peace, love, and free software” bit, I’m no hippy, believe me. What I am is a person concerned by things like COICA, Protect IP and the censorship of communication. You seem to be both agreeing and disagreeing with me at the same time here. The media does in fact matter as the Internet is where these conversations are taking place, it is what’s relevant in global human society. And as for your analogy about carrier pigeons, they can’t broadcast a live conversation between thousands of people nearly instantaneously across the globe. I do appreciate your input though, I want to know what everyone thinks about this. Stefan I’m glad you liked it. This is a subject that I am really passionate about and I want others to be passionate about as well. Free speech and the ability to speak at all in the world forum belongs to every person. Thank you Flynn. It’s an important decision for sure, if not the most important subject in the history of modern communication given how drastically internet services have affected the world. To answer your questions; I’m worried how easily this subject seems to slip under the radar. I’d make an educated guess that 85% of internet users don’t fully comprehend its impact. However, I’m much less worried now than I was a few years ago. I think open source software/technology is reaching a state at which, in the event of this nightmarish scenario ever becoming reality, people can implement alternative means of communication and collaboration that bypasses ISPs and/or middlemen that want to control information consumption. That’s not to say I think it’ll be no problem. And I do find it quite unnerving that acts such as COICA are actually being considered. Especially because I still haven’t seen trustworthy, comprehensive scientific research that shows (black-on-white) to what extent software/music/other piracy is effecting IP profits. That being said, can anyone point me to new research, summaries of past surveys or other neutral analyses? I’d appreciate it if someone can. A final consideration I’d like to share: In the name of protecting IP rights, Torrent websites (such as the Piratebay and others) have been targeted as supporters of piracy because they provide people with means of searching for torrents that *can* be pirated data. But if such search engines for torrents are breaking laws, then aren’t all other internet search engines breaking laws? Most of them allow you to search for specific file types…. such as torrent files. And naturally they are key elements in making people able to find the torrent search engines in the first place. Would you confiscate Google’s servers because they’ve indexed websites with torrent files on them? Demand they delete specific entries from their search index? I wouldn’t. Thanks for the input! I agree that the situation is slightly less scary now that more users are savvy and knowledgeable. I hope to get the word out to more people though. There are a lot of important things happening in this world at any given moment and this is not necessarily more important than anything else, but I do think it needs to be a larger part of the worldwide conversations that we have. Certainly supporting organizations like the EFF are a step in the right direction. As for torrents, I completely agree, blacklisting domains based on their potential to lead a user to pirated content is illogical and irrational.